Itapsa workers filed a petition for an election, but then discovered that they already had a “union”–a unit of the Confederation of Mexican Workers (CTM). They’d never seen the union contract–in essence, a “protection contract,” which insulates the company from labour unrest. For 20 years the Itapsa election has been a symbol of all that’s gone wrong with Mexico’s labour law, which provides protection on paper for workers seeking to organize but which has been routinely undermined by a succession of governments bent on using a low-wage workforce to attract foreign investment. Dana Corporation was just one beneficiary–Itapsa has been the norm, not the exception. In 2015, thousands of farm workers struck U.S. growers in Baja California. Instead of recognizing their new independent union, however, growers signed protection contracts with the CTM, which were certified by the local JCA. Strikers were blacklisted. Later that year workers tried to register an independent union in four Juarez factories. Some 120 workers making ink cartridges for Lexmark were fired, as were another 170 at ADC Commscope, and many more at Foxconn and Eaton. The labour board declined to reinstate the fired workers in Juarez and Baja–following the pattern it had set at Itapsa two decades earlier. Indeed, the JNCs have been key to the defeat of workers’ attempts to form democratic unions, invariably protecting employers and corporate-friendly unions. That could have a big impact on political life in Mexico, where corporate union leaders have had an inside track to political power and corruption. It could change the dominating role U.S. corporations have played in the Mexican economy, and affect relations between workers in both countries. Most of all, it would raise a standard of living for workers that López Obrador has called “among the lowest on the planet.” In his speech to the Mexican Congress during his December 1 inauguration, the new president charged that 36 years of neoliberal economic reforms had lowered the purchasing power of Mexico’s minimum wage by 60 per cent. Today, on the border, that wage comes to a little above $4 per day. Protecting corporations from demands for higher wages has made Mexico a profitable place to do business. Big auto companies, the world’s major garment manufacturers, the global high tech electronic assemblers–all built huge plants to take advantage of Mexico’s neoliberal economic policies, starting more than two decades before the negotiation of the North American Free Trade Agreement (NAFTA). That wild-west climate for investors produced more than low wages, however. Between 1988 and 1992, 163 Juarez children were born with anencephaly–without brains–an extremely rare disorder. Health critics charged that the defects were due to exposure to toxic chemicals in the factories or their toxic discharges. The Chilpancingo colonia below the mesa in Tijuana where the battery plant of Metales y Derivados was located experienced the same plague. In his six-year campaign for office, in which he spoke in practically every sizeable town in the country, López Obrador repeated what he later told the Congress–that only development “to combat poverty and marginalization as has never been done in history” would provide an alternative to migration. In his speech, López Obrador criticized two other neoliberal articles of faith–that privatization of the state-owned section of the Mexican economy would lead to economic growth, and that pro-corporate changes in its labour law would create jobs and higher incomes. Starting before NAFTA was passed, Mexican president Carlos Salinas de Gortari rammed through the Congress changes in the Constitution’s guarantees of land reform, to make private land ownership easier. Many of the communal lands (ejidos), created in previous decades, were dissolved and their lands sold to investors. Farmers became wage workers on land they’d previously owned. Subsequent land reforms led to granting foreign mining companies concessions on over a third of Mexico’s territory, allowing them to develop operations even in the face of local opposition. “Mexico is the origin of corn, that blessed plant,” López Obrador noted bitterly, “and now we are the nation that imports the most corn in the world.” He announced that a CONASUPO-like subsidized food production and distribution system would be reestablished. Privatization marked a 180 degree change in the direction of Mexican economic policy. After its 1910-20 Revolution, nationalists believed that to be truly independent Mexico had to ensure its resources were controlled by Mexicans and used for their benefit. The route to this control was nationalization, to stop the transfer of wealth out of the country and to set up an internal market, in which what was produced in Mexico would be sold there as well. In return, however, Mexican unions gave up autonomy and control of their own affairs. The government registered unions, and oversaw their internal processes and choice of leaders. It never tolerated independent action by workers and unions outside its political structure. When the government changed its basic economic policy, using low wages to attract foreign investment, and producing for the U.S. market instead of for Mexico, the government could and did punish resistance severely. Under Presidents Salinas de Gortari and Zedillo (1988-2000) privatization reforms became a whirlwind. Among the companies and industries affected were the Aeromexico airline, the telephone company, the petrochemical industry dependent on the state-run oil company, the Sicartsa steel mill, the railroad network, many Mexican mines, and the operation of the country’s ports. The leader of the union at Aeromexico was imprisoned after he refused to accept the company’s privatization and the layoff of thousands of workers. The head of one of the largest sections of the union for employees of the social security system, IMSS, also spent months in jail in 1995 for denouncing government plans to privatize the enormous federal pension and healthcare agency. In 1991 the Mexican army took over the port of Veracruz, disbanded the longshore union, and installed three private contractors to load and unload ships. Hourly wages of Veracruz longshoremen fell from about $7.00 to $1.00, even as productivity rose from 18 to over 40 shipping containers handled per hour. When the Sicartsa steel mill was privatized in 1992, wages were cut in half, and 1500 of the mill’s 5000 workers were laid off. They were then rehired as temporary labour under 28-day contracts. Thirteen Mexican financiers became billionaires during the Salinas administration, and Larrea was one of them. Grupo Mexico forced Cananea’s miners’ union to go on strike in 2009, a conflict that is still unresolved. After 65 miners were entombed by an explosion in Grupo Mexico’s Pasta de Conchos coal mine in 2006, the union’s president Napoleón Gómez Urrutia was forced into exile in Canada. He’d accused Larrea of “industrial homicide” for giving up rescue efforts after only three days. This October, Gómez Urrutia was elected Senator in Sonora on the Morena ticket (López Obrador’s party-in-formation), and finally returned from Canada to take office. The harshest privatization came in 2009, when President Felipe Calderon dissolved the state-owned Power and Light Company of central Mexico. In firing all its 44,000 workers, Calderon hoped to destroy one of Mexico’s oldest and most democratic unions, the Mexican Electrical Workers (Sindicato Mexicano de Electricistas–SME). The company’s operations were folded into the Federal Electricity Commission. Private electrical generation was already permitted by Salinas and Zedillo, and López Obrador’s immediate predecessor, Enrique Peña Nieto, had set up plans for private power sale to consumers. Meanwhile, the Federal Electricity Commission itself was slated for elimination. Peña Nieto pushed a Constitutional reform through Congress to reverse the guarantee of national ownership of both the oil and electrical industries. “The hallmark of neoliberalism is corruption,” López Obrador charged. Privatization has been synonymous with corruption in Mexico… The robbery of the goods of the people and the riches of the nation has been a modus operandi… In the last three decades the highest authorities have dedicated themselves to giving concessions to the territory and transferring companies and public goods, even functions of the state, to national and foreign individuals… The government will no longer facilitate looting, and will no longer be a committee in the service of a rapacious minority. To date, only one economic reform enacted by López Obrador’s predecessors has been repealed outright: the education reform that mandated standardized testing for students and testing and firing of teachers themselves. Mexico’s teachers have a long history of resistance and radical politics. More than 100 teachers in the state of Oaxaca alone were killed during their struggle over control of their union, and in defense of the indigenous communities in which they lived. Years of massive teacher strikes against the government’s education reform eventually led to a massacre in Nochixtlan in June 2016, in which nine people were gunned down by federal and state police. In his address, López Obrador had promised, “The so-called education reform will be canceled, the right to free education will be established in Article 3 of the Constitution at all levels of schooling, and the government will never again offend teachers. The disappearance of Ayotzinapa’s youth will be thoroughly investigated; the truth will be known and those responsible will be punished.” In meetings with the democratic teachers caucus he also promised free elections in their union, the largest in Latin America. Eliminating the authoritarian group that has held power in the union for decades could shift the balance between the left and right in Mexico’s institutional politics. Despite the move against education reform, most Mexican unions do not expect the new government to reverse the privatizations that have already taken place, at least not for the first three years of López Obrador’s six-year term. Instead, they have concentrated on winning a basic reform of Mexico’s labour law, which has changed radically during the past two decades. 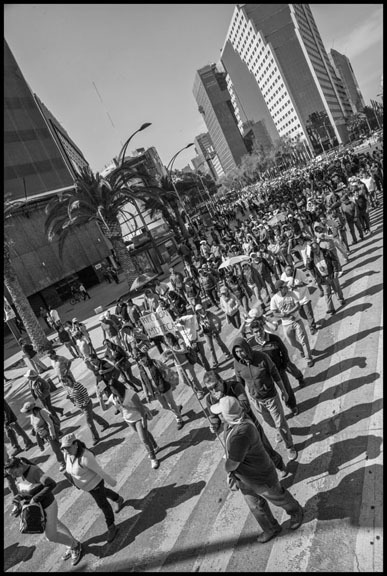 In May 2000, the World Bank made a series of recommendations to the Mexican administration, “An Integral Agenda of Development for the New Era.” The bank recommended rewriting Mexico’s Constitution and Federal Labour Law by eliminating its requirements that companies give workers permanent status after 90 days, limit part time work and abide by the 40-hour week, pay severance when they lay workers off and negotiate over the closure of factories. The bank called for ending the law’s ban on strikebreaking, and its guarantees of job training, healthcare and housing. The recommendations were so extreme that even some employers condemned them. President Vicente Fox (2000 to 2006) embraced the proposal, but it failed to pass the Congress. After further attempts, however, President Felipe Calderon (2006 to 2012) did get a similar reform adopted in 2012. It allows companies to outsource, or subcontract, jobs, which was previously banned. It allows part time and temporary work and pay by the hour rather than the day. Workers now can be terminated without cause for their first six months on the job. Arturo Alcalde, one of Mexico’s most respected labour lawyer and past president of the National Association of Democratic Lawyers, called the reforms “an open invitation to employers, and a road to a paradise of firings.” As he predicted, subcontracting proliferated with disastrous results. In just one instance, Grupo Mexico replaced strikers at the Cananea mine by contracting out their jobs. Inexperienced replacements died in mine accidents, and allowed a huge spill of toxic mine tailings into the Sonora River, contaminating communities and sickening residents. Last year, under pressure from the European Union, which sought a free-trade agreement with Mexico, the Peña Nieto administration had to agree to reform some of the pro-corporate labour practices. The government was forced to ratify Convention 98 of the International Labour Organization (ILO), guaranteeing freedom of association (something the United States has not done). Peña Nieto then got the Mexican Congress to pass a Constitutional reform, embodying these changes. Corporate unions like the CTM, clearly feeling threatened by the reform, introduced their own legislation in 2017 to nullify its effect. They couldn’t get it passed, however, as it became evident that López Obrador would be elected the next president. But changing the Constitution does not change the particular laws that govern labour activity. Implementing legislation must be passed to define rights and procedures, and set up the structure for enforcing the reform. 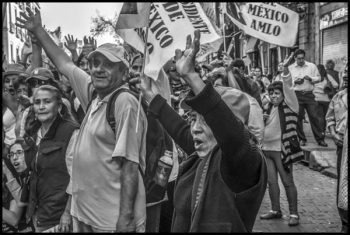 After López Obrador won the election in July, but before he took office in December, Mexican unions and labour lawyers set up a discussion group, the Citizens Labour Observatory, and debated how far the new changes should go. Some wanted to undo Calderon’s 2012 reform completely, by reversing, for instance, the reform laws that now allow subcontracting and temporary employment. In the end, though, the consensus among the democratic unions was to limit the proposal to the implementing legislation that gives workers the right to vote for the union and union leaders of their choice, and to approve their contracts. It was clear this was López Obrador’s favored choice. As Mexico City Mayor in 2000 he had appointed another dean of Mexican labour lawyers, Jesus Campos Linas, as head of the city’s labour board. Campos Linas then made public an estimated 70-80,000 protection contracts whose contents had never been released to the workers they covered. Two days before Christmas, deputies from López Obrador’s Morena Party-in-formation introduced their labour reform bill into the Chamber of Deputies. It will abolish the JCAs and substitute an independent system of labour tribunals. Unions will be independent of the government and business, and leaders must be elected by a majority of the workers. Union contracts will be public, and must be ratified by the majority of the workers in a free and secret vote. In the mid-1990s the telefonistas, together with the Authentic Labour Front (FAT) and two other unions, formed the National Union of Workers, an independent labour federation. They supported López Obrador very strongly. “Our corporate elite had to respond to the fact that the vast majority of Mexicans voted for him, and were unable to use their electoral fraud strategy to deny him victory, as they had in the past,” says Victor Enrique Fabela, vice-president of the union. The strike in Cananea has yet to be settled, and in Nacozari, two of the world’s largest copper mines, the miners’ union was forced out by previous JCA decisions favoring the CTM and Grupo Mexico. The communities on the Rio Sonora are still suffering the health effects of the toxic spill, three years later. And on November 29 at the giant PKC wire harness plant in Ciudad Acuña, just two days before López Obrador was sworn in, CTM thugs marched into the facility, shouting “Mineros Afuera!” [Miners’ Union Out!] as workers were about to vote on the miners’ union as their representative. They overturned ballot boxes, the election was canceled, and the miners say its representatives were beaten. “We all want a change,” charged Moises Acuña, the miners’ political secretary. “We have a chance to move forward now, and we have to use it.” Meanwhile, a new federation of independent unions in the auto industry has also been formed, and plans to fight with the CTM over the right to negotiate contracts with the industry’s giants. 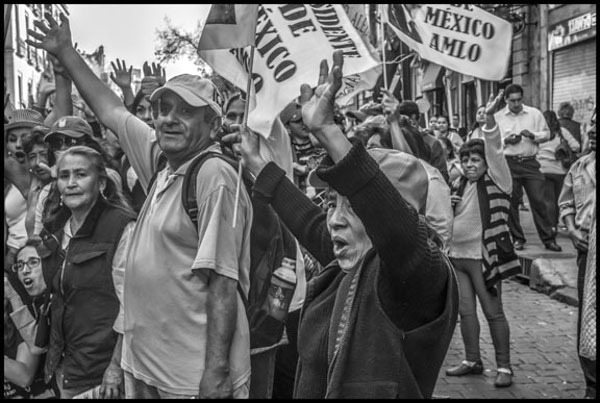 In dealing with the workers’ upsurge and the emergence of new unions, however, López Obrador’s government faces a complex situation. The JCAs will disappear and the new tribunals will be formed. But there are no judges yet, and they won’t be in place for the first three years. The tribunals have to be funded, and judges and personnel trained in administering a completely new law. David Bacon is a California-based writer and documentary photographer. A former union organizer, today he documents labour, the global economy, war and migration, and the struggle for human rights. He blogs at The Reality Check and tweets at @photos4justice.